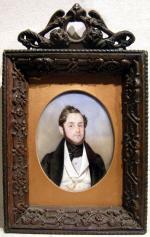 High qualitative miniature portrait of a young gentleman, gouache on ivory, signed and dated J.Bekel, 1836. 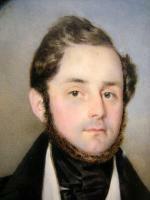 The author Josef Bekel /Beckel) was famous Austrian-Czech miniaturist of Biedermeier Epoch. He was born 1806 in Langenau/Bohemia, died ibid 1865. In 1820 he was the pupil of Praque academy , later studied by Johann Peter Krafft and Anton Peter at the Viennese Academy. 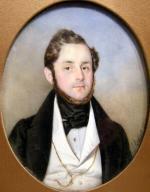 He was educated in Vienna as popular portrait artist, so he created there until 1832 110 portraits in order of aristocracy. Important is his acquaintance with Josef Kriehuber , to his most capable employees he belonged. 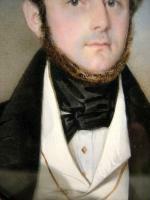 In 1840 he went back to Langenau and painted several portraits of members of families of Count Kinsky and Waldstein. As a result, he took permanent residence in Prague, where he became most wanted tportrait and minature artist of that time in Bohemia. He worked often works in Carlsbad, where painted portraits of Prince Paskiewitch, Malachonski Count, Duke Lita and others. Literature:Artist Lexicons by Prof.H.Fuchs, Prof. Toman, Thieme/Becker. Inscription: signed and dated 1836.